The Larson Electronics HAL-SL-10-LED-E2E Explosion Proof LED String Light set is UL Listed Class I Division 2 Groups A, B, C and D and is ideal for temporary work lighting and inspection activities in hazardous locations requiring explosion proof protection. This 100 watt explosion proof LED string light set from Larson Electronics produces a total combined output of 10,500 lumens of bright white light. Ten, 10 watt LED work lights equipped with hanging eye-bolts are connected in series along 90 feet of 16/3 SOOW explosion proof cord. An explosion proof outlet allows these string lights to be connected end to end, allowing operators to add additional lights at the end. 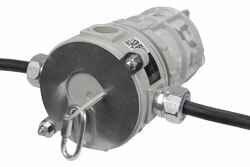 The power cord on this unit is terminated in a Class I, Division 1 explosion proof plug on the input lead and an explosion proof receptacle on the output lead for total explosion proof protection. There is no ballast with this LED string light and the housing on each lamp is constructed of non sparking aluminum which helps to keep weight to a minimum while affording good durability. This hazardous location light string is Class I, Division 2 hazardous location environment approved and is ideal for hazardous work areas where a ready source of easily managed lighting is desired. 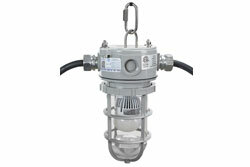 This unit incorporates ten 10 watt LED jelly jar lights connected in series and is suitable for use in areas where petrochemical vapors and various dusts are present. Each LED lamp projects 1050 lumens of light, for a combined total of 10,500 lumens from all ten. The output of this string light is stronger and of better quality than sets equipped with 100 watt incandescent bulbs, yet it uses only 10% as much electrical current. 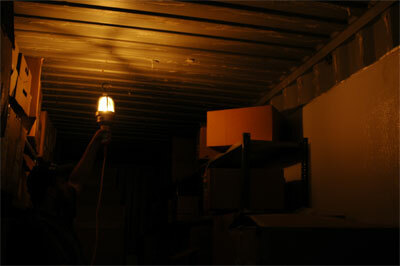 Safety within the workplace is another benefit of LED work lights and temporary lighting. All light sources produce heat. With traditional work lamps, such as incandescent and halogen light sources, the lamp reaches high surface temperatures. These surface temperatures introduce a burn risk to anyone to anyone that allows prolonged skin contact with the light source, as well as a fire hazard if a flammable material is accidentally set too close to the light source for an extended period of time. While LED fixtures do still produce heat, they are designed with heat sinks to properly disperse the heat. Each LED bulb is engineered to disperse and expel this heat quickly and efficiently, keeping the lamp cooler than traditional light sources. This LED work light operates at a lower surface temperature than a comparable model with traditional light source, and thus does not present a significant burn risk if an operator or bystander accidentally brushed up against an exposed lamp, and reduce the fire hazard should they fixture accidentally come in contact with a flammable material for a short period of time. This significantly increases the safety within the work environment. 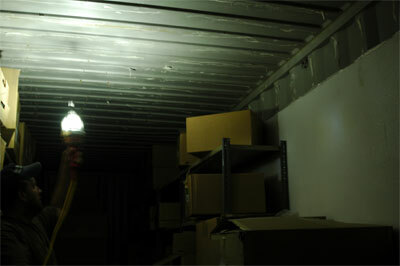 The lamps in this unit are high efficiency LEDs which require no ballast, so there is no inline lamp hardware to manage. This hazardous location LED string light will operate on any voltage ranging from 120 Volts AC to 277 Volts AC on 50/60 Hz. 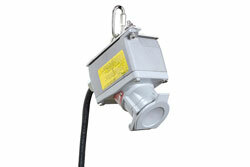 We also offer this light with 11-25 Volts AC/DC. The light produced by this unit has a 6000k color temperature, which is much sharper and whiter than the light produced by incandescent lamps.